On a summer where superheroes are set to invade our screens (Captain America, X-men prequel, Green lantern etc...), Thor is launching the first salva of superpowers mayhem. I have to admit I had low expectations for this. The trailer was rather uninspiring, and Kenneth Branagh at the helm did not inspire confidence, responsible as he is for a string of dour Shakespeare adaptations and little else. (Remember Dead again in 1991? Thought not). Thor is an origin story of sort, presenting the God of thunder as an arrogant warmonger, who, after bringing his realm into the brink of war, is stripped of his powers and banished to Earth, while his fiendish brother Loki plots to take over their kingdom. On Earth, Thor has to learn humility to find his place back in his own world and save it. 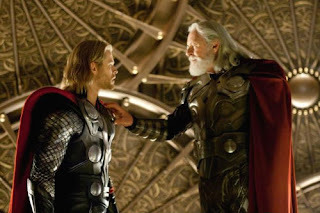 Of all the Marvel superheroes, Thor was probably the trickiest to bring to the screen. The imagery of Norse gods mythology and having the lead character as the God of thunder with a winged helmet and a cape could easily have turned this into the high camp territory of such 80's masterpieces as Flash Gordon and Masters of the universe. So the fact that this movie adaptation never gets close to silly and ridiculousness is a success to begin with. 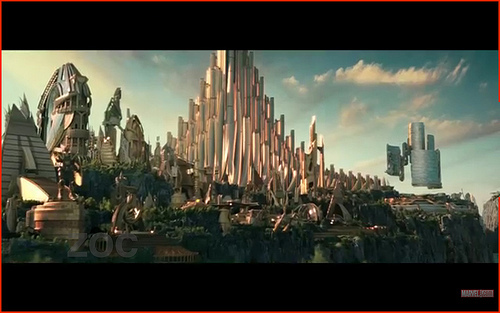 In fact, one of the film's biggest achievements is the creation of Asgard, the realm of the Northern Gods. What could have looked like some cheap set straight out of a low rent sy-fy channel, is rendered with a majesty and a sense of wonders that is truly magical. And while the trailer does show an awful lot of the film, it mercifully only offers a fleeting glimpse of Asgard, where a lot more of the action takes place than I expected (and these are by far the best parts). In fact, who would have thought Kenneth Branagh had it in him to create such an enjoyable experience. The film is fast paced and exciting, an unashamed and earnest epic fantasy that does not feel the need for smart pop cultural jokes (bar a few short and ill-advised ones still) to connect with its audience. And then of course, the choice of the British director becomes all the more obvious as the story unfolds, with its Shakespearian undertones of Royal family feuds and betrayals, which gives more depth to the narrative than your usual superhero movie. Australian actor Chris Hemsworth does a great job in the lead part, with a mixture of youthful arrogance and exuberance, yet with the commanding presence that the part required. Anthony Hopkins brings some gravitas as Odin, reminding us what an inspired actor he can be (when he can bothered). 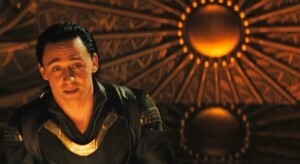 But he true revelation of the film however is British thesp Tom Hiddleston as tortured and mischievous Loki. It is hard to believe that it is the same actor who played, weedy, idealistic upper middle class Edward in hit British indie Archipelago. He plays a rather more complex villain than usual with such intensity and depth, and owns the screen whenever he is on. If rumours are to be believed and he will be the main villain on the Avengers movie (starting shooting today! 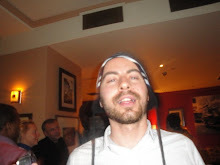 ), then we are in safe hands! Sadly, the women in the film fare less well. Natalie Portman is given very little to do (and the shoot must have seemed like a holiday after the psychological and physical traumas endured during Black swan!) and comedy sidekick Kat Jennings is a woefully unnecessary character. The one concern I have for the Avengers adapation however, is the very different tone for Iron Man and Thor (let alone Hulk, and some of the other lesser characters). While Iron Man is lot more grounded in reality, Thor is firmly put in the realm of the fantasy and I am not sure how these are going to mix. You can probably expect a lot of chalk and cheese banter between Starck and the God of thunder. Great, awesome movie! 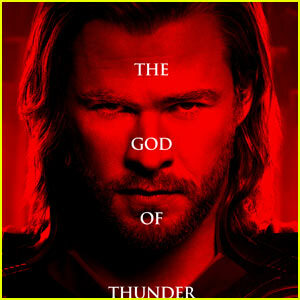 Asgard was done magnificently, the music was great, and lent the right epic emotion, you need in the movie THOR. I thought Rene Russo was very good as the queen ... and the continuity of the guys from SHIELD, from previous Marvel movies, was perfect. Lead man was the star of the show (though yes; Loki was an interesting, hard-to-read villain) ... That guy was SPOT-ON for Thor. 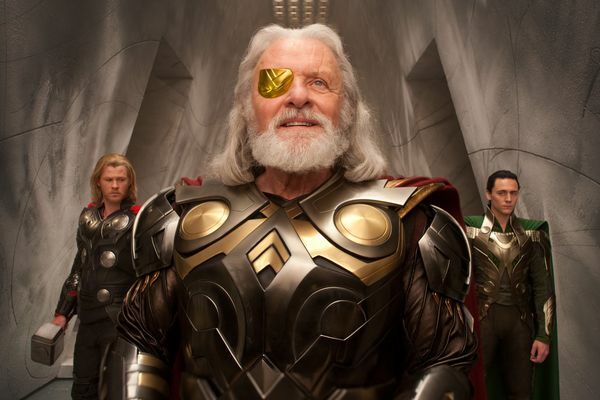 Had the height, the swagger, everything ... even retained his classy Asgard accent, when he wound up on earth. There was nothing ... Nothing about this movie that was 'phoned in'.